We have traced the name GATES from Cincinnati, Ohio to Nuremberg, Germany and found the spelling of the name changed as it went back in time from GATES to GOETZ, to GÖTZ, to GÖZ. We have found that the name GOETZ, GÖTZ, and GÖZ are all pronounced “gets, as in Stan Getz, or “guts,” meaning pet form of “good” or “God” in German. But we have left out half of the family- the wives! Each wife is another character in our family story and she represents another family surname to study. Who were these wives and where did they come from? The only way to find these wives is by searching just a few church records listing marriages, births and deaths of four generations. Besides the names and dates, all we really know from these records is the town in which the birth, marriage or death occurred and the occupations of the fathers. Apparently, not much to build a riveting story upon but nonetheless, if you read on, you’ll find mystery, revolution, serendipity, discovery and surprise, all derived from just these plain facts. On the chart you will see that we have three generations of paternal GOETZ/GÖTZ ancestors but only one generation of ancestors on the maternal STEFFLER line. On the GÖTZ side, we have three other surnames of the wives: ORFF, WEISSPOMCRAZ (WEIßPOMCRAZ in German), and ZELTNER, each representing other ancestral lines. The two recent GÖTZ men were filemakers, as was the ORFF family, but the earlier GÖTZ men were blade sharpeners. The ZELTNER and STEFFLER men were spur-makers, and the WEISSPOMCRAZ was a trader. Except for the trader, their occupations were all involved with metal and perhaps even the trader, if he traded metals. We’ve got the characters, so now we need the setting. We know the story takes place in Nuremberg, Germany. 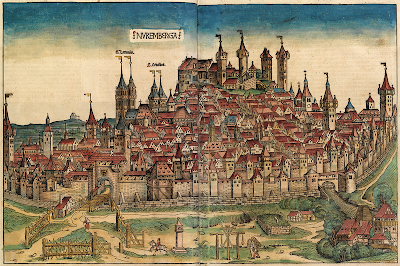 It seems that Nuremberg was fortuitously situated on both the east/west and the north/south European trade routes and so became a hub of prosperous trading. Thus, the old German proverb: "Nuremberg's hand goes through every land." Despite “the town had no vineyards nor was the Pegnitz a navigable stream and the soil was poor” (reasons given to King Frederick in 1219 when requesting his protection of the town), by the end of the fourteenth century, Nuremberg became the main European producer of metal ware due the abundant iron ore deposits of the Upper Palatinate, newly acquired territory at its northeastern edge. The oldest records show that the Johann Orff and Alexander Zeltner families lived in Nuremberg to start with, around 1720. The Orffs were filemakers and the Zeltners were spur makers, both metal workers. Might their families have been associated with each other because they were both metalworkers? 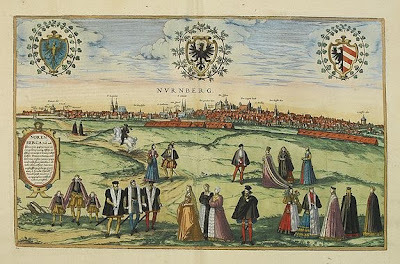 The Zeltner spur maker daughter, Margareta, marries the Off file maker son, Christoph, in Nuremberg in1773 and they had an Orff daughter, Anna Barbara, who was waiting in Nuremberg for the Götz boy to come along. Seven miles outside of Nuremberg, in Gerasmühle, the Nicolaus Göz family men were blade sharpeners in the early 1700’s. The Göz son, Heinrich, married Maria, the daughter of a Jacob Weisspomcraz, a trader from Schweinau, a town two miles outside of Nuremberg, in 1762 and they had a Götz son, Johann, who moved closer in to the center of Nuremberg. Johann became a file maker, perhaps working with the Orff file maker family. He marries the waiting Anna Barbara Orff file maker daughter in 1798. They had a Götz son, Christoph, in 1809, who also became a file maker. This Christoph Götz then married Anna Sibylla, a daughter of a Spur maker, Lorenz Steffler, in 1838. It was this couple, Christoph Götz and Anna Sibylla Steffler, who lived through the years leading up to the revolution of 1848 and who had the 6 Götz children who all came to Angola, Indiana. Now that you have a rough idea of the people in this Goetz clan, perhaps you’d be interested in following the more detailed story about the individuals, the action of the story. The parents of our great grandfather, John C. M. GATES, were Christoph GOETZ (GÖTZ), the “Feilenhauermeister” (master file maker) and Anna Sibylla STEFFLER. They were married 13 Feb. 1838 at St. Jakob's church in Nuremberg, Germany. Christoph died in Germany in 1857 but his wife and four sons, Lawrence, John C.M., Christopher, William and two daughters, Margaret and Christina Barbara, immigrated to Angola, Indiana between 1853 to1867. The marriage record of Christoph GÖTZ and Anna Sibylla STEFFLER, lists Anna Sibylla as the "Tochter" (daughter) of the "Spornmeisters" (master spur makers) Lorenz STEFFLER and Anna Margaretha. Lorenz STEFFLER was the grandfather who brought the first of the GÖTZ family, Lawrence GATES (John C.M. GATES' older brother) to Angola, Indiana in 1853, dropped him off and then left him there at age 14, presumably with friends. On the 1860 Angola, Indiana census, Lawrence, age 21, is living with the Ebenezer JOHNSON family and is listed as a farm laborer. This remains a mystery. Was Angola a town that was populated with many Germans? Did the GÖTZ family have a friend there that would apprentice their son? And why that particular age? Was the GÖTZ family trying to avoid some required German military training since the boys immigrated at ages 14, 19 and 17 in 1853, 1864 and 1865? Perhaps the GÖTZ family might have been one of the many skilled and educated German families who gave up on Germany after the failed revolution of 1848. "Forty-eighters" they were called- they were the thousands who streamed to America in hopes of a country "freer" than their own after the revolution that "never happened." Was this the "war" that our family oral history referred to? So many Germans came to the US after 1848 that certain U.S. cities had whole sections that completely replicated German life. Cincinnati, Ohio, where John C.M. Gates lived and Milwaukee, Wisconsin, where John C.M.’s younger brother, Christopher Gates, first lived, were two such cities. After their father, Christoph, died in 1857, John C.M. GÖTZ came to the U.S. in 1864, at age 19, and his younger brother, Christopher came a year later in 1865, at age 17, both changing their name from GOETZ/GÖTZ to GATES. 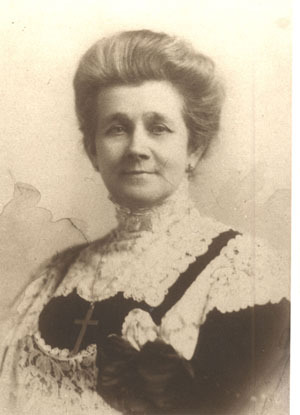 It would be another 10 years before Christoph's widow, Anna Sibylla GÖTZ, would come with her two married daughters, Margaret and Christina Barbara and their husbands, Herman FIEDLER and Georg Leonard WEISS, and Anna's youngest son, William, age 12, to join their brothers in the same town of Angola, Indiana, in 1867. Many educated Germans arrived in the U.S. only to discover they couldn’t find any work. Our Gates men were lucky. John C.M. worked first as a clerk, then as a distillery salesman in Cincinnati, Ohio and Christopher became a civil engineer in Milwaukee, Wisconsin and Toledo, Ohio. Their oldest brother Lawrence served in the Civil War and then worked in dry goods, then banking and fire insurance in Angola, Indiana and their youngest brother, William, eventually became a tailor, also in Angola. John C.M. GATES' paternal grandparents were Johann Wolfgang GÖTZ, a Feilenhauer (file maker), and Anna Barbara ORFF. 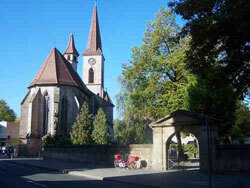 Johann and Anna Barbara were married at the St. Lorenz church in Nuremberg, Germany in 1798. Johann Wolfgang GÖTZ was from a different part of Nuremberg known as Gerasmühle, about 7.5 miles southwest of the center of Nuremberg. Johann Wolfgang GÖTZ and Anna Barbara ORFF had nine children, born between 1799 and1811, including one set of twins. Christoph, John C.M. GATES' father, was the 8th child of that family. 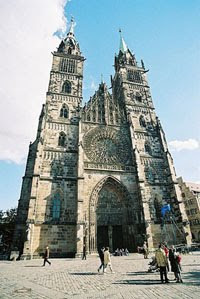 According to records from the St. Lorenz and St. Jakob’s Churches in Nuremberg, Christoph GÖTZ ' 8 siblings were: Johann Benedikt, Margareta Barbara, Conrad Christoph, Johann Georg, Maria Barbara, Heinrich and Ursula Margareta (twins), and Conrad Wolfgang. Church records show that three of these GÖTZ siblings married: Conrad Wolfgang Götz married a Maria Sabina BAYERLEIN in 1846. Johann Georg Götz married a Christina Barbara BACKRASS in 1832. And in 1823, Margareta Barbara Götz married a Johann MERKEL! (Small world!) Any of these married siblings might have living descendants who would be our German cousins, maybe even living right now in Nuremberg! John C.M. GATES’ great grandfather (father of Johann Wolfgang GÖTZ) was Heinrich GÖZ, a “Klingenschleifermeister,” (master blade sharpener) from Gerasmühle. Note the name GÖTZ was then spelled GÖZ. Heinrich GÖZ’s wife was Maria Magdalena WEISSPOMCRAZ. They married in 1762 at St. Leonhard’s Church. John C.M. GATES’ other set of known great grandparents (Anna Barbara ORFF’s parents) were: Christoph ORFF, a “feilenhauermeister,” and Margareta Barbara ZELTNER. They were married in St. Lorenz Church in 1773, three years before the Declaration of Independence was signed in Philadelphia, PA.
From Heinrich GÖZ and Maria Magdalena WEISSPOMCRAZ's marriage record we learn that Heinrich was the son of Nicolaus GÖZ, a “Klingenschleifermeister,” master blade sharpener, from Gerasmühle. We also learn that Maria Magdalena WEISSPOMCRAZ was the daughter of Jacop WEISSPOMCRAZ, a "handelsmann" (trader) from Schweinau, a town 2 miles outside the center of Nuremberg. From Christoph ORFF and Margareta Barbara ZELTNER's marriage record, we learn that Christoph Orff’s parents were Johann ORFF, from Nuremberg and Margareta Barbara. We also find that Margareta Barbara ZELTNER's father was Alexander ZELTNER, of Nuremberg, and her mother was Barbara. A lot of Barbara’s. Notice how the names Christoph, Johann, Lorenz, Anna, Margaret and Barbara repeat through the generations? Alexander ZELTNER is listed on their marriage record as a “Spornmeister” or master spur-maker. This is as far back that our GOETZ German ancestors go. They would be our great, great, great, great, great, grandparents! ZELTNER seems to be a prominent name in Nuremberg. Not sure if any of these Zeltners are related or not, but in 1877 in Nuremberg, a Johannes ZELTNER was awarded a patent for producing synthetic ultramarine red. In 1716, in Nuremberg, Johann Conrad ZELTNER published the biographies of 100 proofreaders. And in 1722, in Nuremberg, Gustav Georg ZELTNER, a Protestant theologian, published books on M. Luther and was a Christian scholar on Hebrew literature. Anyone want to do some research and see if these ZELTNERs are related to our Alexander? Is there anything to discover from all this history? 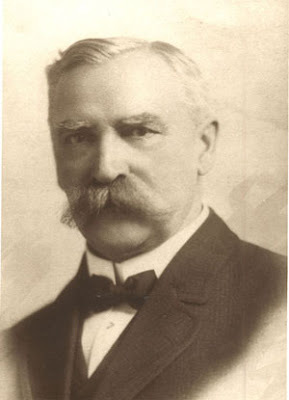 The family story handed down to me about our Goetz history was that our “stern great grandfather” (John C.M. Gates) was the driving force of our family’s Catholic orientation and that he had left Germany because of religious persecution. 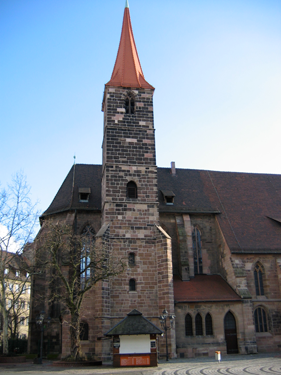 Although originally Catholic churches, St. Lorenz and St. Jakob, the churches in Nuremberg where John C.M. Gates’ parents, Anna Sibylla and Christoph GÖTZ, were baptized, married and where their children were baptized (and the same the churches in which the earlier generations of GÖTZ, ORFF, WEISSPOMCRAZ and ZELTNER families were baptized, married and buried), these churches were Protestant since the time of the Reformation, about 1517! These facts give us good reason to believe that John Charles Marcus GATES was Protestant by birth and converted to Catholicism probably when he married Elizabeth LaSalle Meyers, our great grandmother, in 1870, only a short 6 years after he arrived in the US. Elizabeth LaSalle Gates was always referred to as a "strong Catholic" by her daughter-in-law, Frances Lenore (Myers) Gates and, in her photographs, Elizabeth is often seen wearing a large cross on a necklace. Did Elizabeth’s Catholicism come from her parents? Although Elizabeth’s father, Ernest Robert LaSalle, was from France, Elizabeth’s mother, Barbara Hemerling, was from Wurttemberg, Germany and Elizabeth's adopted father, Andrew Meyers, was from Hesse-Darmstadt, Germany. Were these areas where Catholics were dissatisfied with minority treatment in Protestant Germany and wanted to emigrate? More research into the history of Catholics in Germany is clearly necessary! All of our upbringings have always had a strong Catholic theme, passed down from our parents, passed down from their father, Augustus J. Gates, who was Elizabeth's seventh child. Does it surprise you to consider that all our family's Catholicism derived from Elizabeth LaSalle instead of from her husband, John C.M. Gates? Doesn’t THAT change the way you see yourself?